We round up the best TV and movies highlights coming to Prime Video and available through your BT TV box in April and coming soon. We give our customers access to Amazon Prime Video’s incredible collection of TV and movie content at the push of a button. But if you're up to date with The Marvelous Mrs. Maisel and you've already binged the brand new series of Jack Ryan, you'll be pleased to know there's a ton of new content coming soon to Prime Video. From the return of Bosch and The Bold Type, to brand new TV series like Good Omens and The Boys, we round up the best new films and TV shows coming soon to Prime customers. Season 1 of Hanna will launch on Prime Video on Friday, March 29. Raised in total seclusion in the remote woods of Eastern Europe, 15-year-old Hanna (Esmé Creed-Miles, Mister Lonely) has spent her entire young life training to fight those who hunt her and her mercenary father, Erik Heller (Joel Kinnaman, House of Cards). Her survivalist skills are finally tested when she and Erik are separated upon their discovery by a rogue CIA operative, Marissa Wiegler (Mireille Enos, Good Omens) and her team of agents. Hanna has no choice but to embark on a perilous journey alone across Europe as she seeks to reunite with her father and evade - and ultimately take down - the dangerous agents who target them. Hanna’s isolated upbringing leads her to face particularly daunting physical and emotional challenges along the way, as she navigates an ever-deepening conspiracy - one that could be the undoing of both her and her father. Based on Joe Wright’s acclaimed 2011 film, Hanna’s eight episode first season was written by David Farr (The Night Manager), who co-wrote the original feature. The second season of The Tick, featuring 10 all-new episodes, debuts on Prime Video on Friday, April 5. In its second season, Tick (Peter Serafinowicz, Guardians of the Galaxy) and Arthur (Griffin Newman, Draft Day) have freed the City from The Terror - now they must defend it from new villains and old enemies. That is if they can convince AEGIS, the government agency in charge of superhero regulation, that they deserve the job. But now that the City is ‘safe enough to protect’ Tick and Arthur begin to see they’ve got competition. TV series The Tick, based on the comic book character of the same name, has a 90% approval rating on review aggregation site Rotten Tomatoes. The third season of glossy magazine drama The Bold Type will premiere in the UK on Wednesday, April 10 on Prime Video, TVWise.co.uk confirms. The Bold Type reveals a glimpse into the outrageous lives and loves of those responsible for the global women's magazine Scarlet. The rising generation of Scarlet women leans on one another as they find their own voices in a sea of intimidating leaders. Together they explore sexuality, identity, love, and fashion. In the third season, Jane, Kat and Sutton will continue to push the boundaries of what it means to be young women juggling careers and love lives while embracing their identities. The Bold Type is inspired by the life of Hearst Magazines Chief Content Officer, Joanna Coles. The fifth season of Bosch will premiere in the UK on Prime Video on Friday, April 19. In season 5, 15 months after bringing his mother's killer to justice, LA homicide detective Bosch (Titus Welliver, above left) finds himself seeking the truth on two fronts. New evidence in an old case leaves everyone wondering whether Bosch planted evidence to convict the wrong guy. And a murder at a Hollywood pharmacy exposes a sophisticated opioid pill mill, sending Bosch down a dark and perilous path in pursuit of the killers. Based on Michael Connelly’s novels, Amazon has already renewed the series for a sixth season. 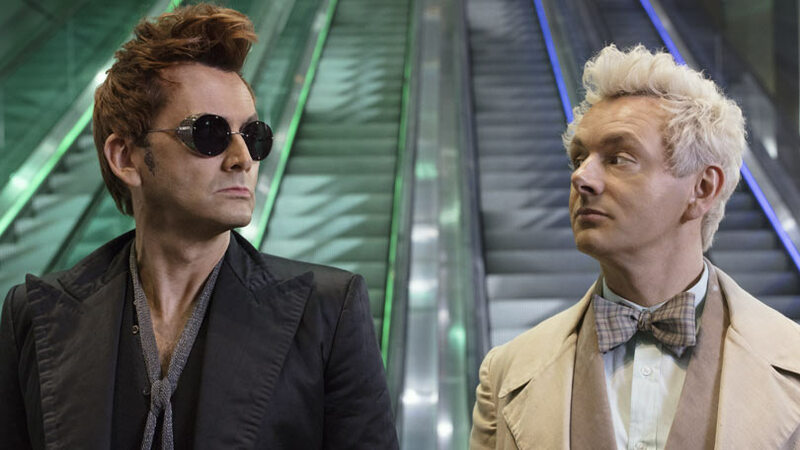 Good Omens is premiering on Prime Video on Friday, May 31, before airing on BBC Two at a later date. Based on the beloved book by Terry Pratchett and Neil Gaiman, Good Omens tells the story of a fussy Angel and a loose-living Demon who've become overly fond of life on Earth - and are forced to form an unlikely alliance when the end of the world if coming. But they’ve lost the Antichrist, an 11-year-old boy unaware he's meant to bring upon the end of days, forcing them to embark on an adventure to find him and save the world before it's too late. Michael Sheen, David Tennant (both featured in full costume above), Jon Hamm and Mark Gatiss all star in the adaptation, while Benedict Cumberbatch will play the voice of Satan. Goliath season 3 is coming to Prime Video in 2019, although a release date has yet to be confirmed. Seasons 1 and 2 are available to stream now. Once a powerful lawyer, Billy McBride is now burnt out and washed up, and spends more time in a bar than in a courtroom. When he reluctantly agrees to pursue a wrongful death lawsuit against the biggest client of the massive law firm he helped create, Billy and his ragtag team uncover a vast and deadly conspiracy, pitting them all in a life or death trial against the ultimate Goliath. Goliath has been labelled a “masterpiece”, a “must-watch” and “perfect” by fans, with Billy Bob Thornton’s performance called “reliably terrific”. TV series The Boys will premiere on Prime Video in 2019, but a release date has yet to be confirmed. Comic book adaptation centered on a CIA squad tasked with keeping superheroes in line by any means necessary. The Boys has been adapted for television by Seth Rogen (above) and Evan Goldberg, who also helped to develop fellow Prime Video series, Preacher. TV series Too Old to Die Young will premiere on Prime Video in 2019, but a release date has yet to be confirmed. Too Old to Die Young is created by Nicolas Winding Refn (above) - the director of Drive, Only God Forgives and The Neon Demon. The fourth and final season of The Man in the High Castle will launch on Prime Video this autumn. The final season of The Man in the High Castle will be rocked by war and revolution. The Resistance becomes a full-blown rebellion, driven by Juliana Crain's (Alexa Davalos, Mob City) visions of a better world. A new Black insurgent movement emerges to fight the forces of Nazism and imperialism. As empires teeter, Chief Inspector Takeshi Kido (Joel De La Fuente, Hemlock Grove) will find himself torn between his duty to his country and the bonds of family. Meanwhile, Reichsmarschall John Smith (Rufus Sewell, Victoria) will be drawn towards the portal the Nazis have built to another universe, and the tantalising possibility of stepping through a gateway to the path not taken. The Man in the High Castle was a breakout hit when it launched on Amazon back in 2015, becoming its most-viewed original series on the service, according to HollywoodReporter.com. The fourth and final season of Mr Robot will return in 2019, according to USA Network. Mr. Robot follows Elliot Alderson (Rami Malek), a cyber-security engineer who, along with Mr Robot (Christian Slater) and hacker group fsociety, starts a revolution to change the world. Since appearing Mr. Robot, Malek has gone on to win an Oscar for his portrayal of Freddie Mercury in Bohemian Rhapsody. Amazon bought worldwide rights to political drama film The Report at the Sundance Film Festival in January 2019, targeting an autumn 2019 release, according to The Hollywood Reporter. The Report is is based on the true story of the Bush-Cheney era torture programme, centering on Senate staffer Daniel Jones, who is assigned the task of leading an investigation into the CIA’s Detention and Interrogation Program. After analysing extensive evidence, he learns about the “enhanced interrogation techniques” - proved to be ineffective - that the CIA adopted after 9/11. When Jones and the Senate Intelligence Committee attempt to release the results from his investigation, the CIA and White House go to great lengths to prevent the truth from getting out. Amazon acquired US rights to comedy film Late Night at the Sundance Film Festival in January 2019. UK rights and a release date have not been confirmed. Emma Thompson (pictured) stars as a Letterman-esque talk show host whose world is turned upside down after she attempts to address diversity concerns by hiring her first female staff writer (Mindy Kaling), according to The Hollywood Reporter. Canadian scriptwriter Nisha Ganatra, whose credits include the critically-acclaimed Amazon TV series Transparent, directed Late Night from a screenplay written by The Office star Kaling. The series is currently in pre-production and is thought to be released sometime in 2019. Utopia is a nine-episode series from award-winning Gillian Flynn, based on the British series of the same name written by Dennis Kelly. A group of young adults who meet online are mercilessly hunted by a shadowy deep state organisation after they come into possession of a near mythical, cult, underground graphic novel. They discover the conspiracy theories in the comic’s pages may actually be real and are forced in to the dangerous, unique and ironic position of saving the world. Of the partnership, Gillian says: “Utopia is pure creative catnip to me. Dennis Kelly’s show blew my mind, and he has been so incredibly generous in letting me crack open his world and play around in it and make it my own weird, wild place. Gillian Flynn is the best-selling author and screenwriter of Golden Globe-nominated film Gone Girl and HBO’s Sharp Objects - one of the most talked about TV series of 2018. The show is expected to debut on Prime Video in 2019-2020. Billed as the next big unscripted series after The Grand Tour, Bear Grylls (above) is set to host the gruelling expedition competition featuring people from around the world facing off against each other and mother nature, in a show produced by MGM Television. Eco-Challenge 2019 is being labelled as the toughest global outdoor multi-sport endurance race on Earth. Carnival Row is slated for a 2019 release on Prime Video. The show was subject to a fierce bidding war between studios, and stars both Orlando Bloom and Cara Delevingne (above in interview for the show) - the latter being her first ever TV project. The third season of Sneaky Pete doesn’t have a release date, but we predict it will drop on Amazon Prime in spring 2019. This is based on the fact there was almost a 14-month gap between the release of the first and second series. Created by Breaking Bad’s Bryan Cranston (who also appears in the series) and The Good Doctor’s David Shore, Sneaky Pete is an American crime drama series following the misadventures of Marius Josipovic. Marius is a released convict. After serving time for a series of confidence tricks, upon his release he discovers that there’s a hit out on his life. In attempt to lay low and dodge powerful gangster Vince (played by Bryan Cranston) he moved to upstate New York and adopts the identity of Pete Murphy – his former prison cell mate. Marius is soon accepted by Pete's family as their long-lost son - easily done as the real Pete hasn’t been home in 20 years. As he settles into his new life as Pete, his new family turns out to be far quirkier and complicated than he initially thought. How long can he keep his web of lies instact? And how long before Vince finds him in his new small-town hideaway? The plot for season 3 hasn’t been announced. Sneaky Pete has gained something of a cult status amongst fans since its 2015 launch. A second series of action thriller Jack Ryan was confirmed in 2018. While a premiere date hasn't been announced yet, it’s thought to launch around summer 2019, like the first season did. ComicBookMovie.com reports that Amazon has had renewed Tom Clancy's Jack Ryan for its third season, set to debut in 2020. In season 1, CIA analyst Jack Ryan (John Krasinski, The Office) stumbles upon a suspicious series of bank transfers. His search for answers pulls him from the safety of his desk job and catapults him into a deadly game of cat and mouse throughout Europe and the Middle East, with a rising terrorist figurehead preparing for a massive attack against the US and her allies. The plot for season 2 hasn’t been announced. The first season of Jack Ryan was one of the most highly anticipated TV events of 2018. The second series of The Marvelous Mrs Maisel landed on Prime Video in December 2018, but a release date for season 3 hasn’t been announced. We expect it to land on Prime Video late November/early December 2019. Series 2 explores Midge’s career as a stand-up comic, while the plot for season 3 hasn’t been announced yet. Following its December 2018 release, we named The Marvelous Mrs. Maisel “the most important TV show right now”. A release date for the second season of Homecoming hasn’t been confirmed, but DigitalSpy.com reckons it will be released in November 2019. Heidi Bergman (Julia Roberts) is a caseworker at Homecoming, a Geist Group facility helping soldiers transition to civilian life. Heidi quickly realises that there's a whole other story behind the story she's been telling herself. The plot for series 2 is thought to deviate from the second half of the Gimlet Media podcast on which it was based. Despite not returning to Homecoming as its lead star, Julia Roberts, above, will remain on the show as an executive producer alongside series 1 director, Sam Esmail. A release date for James May’s solo TV show has not been confirmed, but it started filming in March 2019. Fifteen years after James May first visited Japan as a baffled tourist, he embarks on a quest to understand the unique, extraordinary and complex country. James will embark on an epic journey across all of Japan from North to South, determined to understand why this unique land and its people are the way they are, what drives their whole culture and what their approach to life can teach the rest of us. Our Man in… Japan is the service's first spin-off show featuring one of the three Grand Tour presenters since they left the BBC for Amazon Prime. Jennifer Salke, Head of Amazon Studios (above), has said that ‘2021 is the hope’ in terms of a Prime Video release but there are other people who ‘wish it was 2020’, so we shall have to keep our fingers crossed on that one. Based on the celebrated fantasy novels by J.R.R. Tolkien, the multi-season series will be produced by Amazon Studios in cooperation with the Tolkien Estate and Trust, HarperCollins and New Line Cinema - a division of Warner Bros. Entertainment. “The Lord of the Rings is a cultural phenomenon that has captured the imagination of generations of fans through literature and the big screen,” said Sharon Tal Yguado, Head of Scripted Series, Amazon Studios. Matt Galsor, a representative for the Tolkien Estate and Trust and HarperCollins, said: “We are delighted that Amazon, with its longstanding commitment to literature, is the home of the first-ever multi-season television series for The Lord of the Rings. Peter Jackson's three-part movie adaptation of the world-renowned literary work earned a combined gross of nearly $6 billion worldwide, garnering a combined 17 Academy Awards including Best Picture for the final instalment, The Return of the King. The television adaptation will explore new storylines preceding the first part of the book, The Fellowship of the Ring. Explore Middle-earth from The Lord of the Rings on Prime Video now. The series is currently in pre-production and a release date has yet to be confirmed. Barry Jenkins (Moonlight, above) will direct all episodes of the highly anticipated adaptation of The Underground Railroad. Based on Colson Whitehead’s Pulitzer Prize-winning novel, The Underground Railroad won the National Book Award and was an Oprah Winfrey Book Club pick. The book is about Cora, a slave on a cotton plantation in Georgia. Life is hell for all the slaves, but especially bad for Cora; an outcast even among her fellow Africans, she is coming into womanhood - where even greater pain awaits. When Caesar, a recent arrival from Virginia, tells her about the Underground Railroad, they decide to take a terrifying risk and escape. Barry Jenkins won an Oscar and two Golden Globes for his work on the 2016 movie Moonlight. Robert Jordan's bestselling novels The Wheel of Time - set in an epic world where magic exists, but only women can use it - will be adapted into a female-led action fantasy series by Amazon and Sony. According to Deadline, The Wheel of Time has sold over 90 million books worldwide. A release date for The Hunt has yet to be announced. Jordan Peele (above), the Oscar and Emmy Award winning writer-director of Get Out, signed a first-look deal with Amazon, with The Hunt the second project in production after Lorena. The Hunt is a drama about a group of Nazi hunters in the 1970s who seek out justice on their own terms. An extended description on Deadline.com reveals that The Hunters, as they’re known, have discovered that hundreds of high ranking Nazi officials are living among them and conspiring to create a Fourth Reich in the U.S. The eclectic team of Hunters will set out on a bloody quest to bring the Nazis to justice and thwart their new genocidal plans. US actor Logan Lerman (Noah, Fury) is in talks for a lead role in the series, playing the character of Jonah Heidelbaum. Drama series The Expatriates was announced in 2018, but a release date has yet to be revealed. Oscar, Golden Globe and Emmy Award-winner, Nicole Kidman (above) and her production company, Blossom Films, are making original series that will be available exclusively on Amazon Prime Video. The Expatriates, an adaptation of the book by Janice Y. K. Lee, marks the first project under Kidman’s deal with Amazon Studios to get a green light, reports Deadline.com. Kidman is being lined up to star in the drama series, which explores the personal and professional lives of a tight-knit group of expatriates living in Hong Kong. “After announcing our recent first look deal with Nicole and Blossom Films, we are thrilled to kick off this relationship by bringing this very popular novel from author Janice Y.K. Lee to Prime Video,” said Jennifer Salke, Head of Amazon Studios. Blossom Films, created by Nicole Kidman and Per Saari, executive-produced the Emmy and Golden Globe-winning limited series, Big Little Lies, for HBO. It’s currently in development, but release dates have not been announced. Amazon is developing a Conan the Barbarian TV series, based on the books by Robert E. Howard, according to Deadline.com. Game of Thrones director Miguel Sapochnik (above) is involved in the project, alongside The Handmaid’s Tale and Fargo executive producer Warren Littlefield. Expect a big-budget blockbuster TV show as Amazon hopes to fill the fantasy void that Game of Thrones will leave following its 2019 conclusion. Release dates have yet to be announced. Neil Gaiman (above) will exclusively work with Amazon Studios on the creation of television series which will premiere globally on Amazon Prime Video in over 200 countries and territories. Gaiman is the creator of Good Omens and American Gods. Blake Lively (above) is in talks with Amazon Studios for a scripted TV series with a fashion theme, according to the Hollywood Reporter. It will have a merchandising component that will take advantage of Amazon’s e-tailer foundation. If there’s anyone we’d want to see create a fashion TV show, it’s Lively - she’s known for her killer red carpet and off-duty style. Project Runway co-hosts Heidi Klum and Tim Gunn (above) are teaming up for an untitled global fashion TV competition series for Amazon, according to the Hollywood Reporter. Amazon says the series will make fashion accessible to a wide and global audience. Klum and Gunn are Emmy-award winners for Project Runway. There’s currently no release date for the 10-part TV adaptation of The Power, which was greenlit in February 2019. The Power is based on the 2017 novel by Naomi Alderman, pictured above. The thriller takes place in a world where teenage girls suddenly develop the ability to electrocute people at will. Amazon has enlisted producers from The Handmaid's Tale and Broadchurch for a series that gives new meaning to "girl power”, according to HollywoodReporter.com. The as-yet-untitled project from the Russo Brothers does not have a release date, but it was revealed in July 2018. Amazon is teaming with Joe and Anthony Russo to develop what it described as an "ambitious concept" meant to captivate its Prime Video audience and "redefine the boundaries of storytelling”, according to HollywoodReporter.com. The Russo Brothers are the directors of smash-hit Marvel films including Avengers: Infinity War and Avengers: Endgame. An air date for the as-yet-untitled documentary about the famous Jonas Brothers has not yet been confirmed, as it was only announced in March 2019. Amazon Studios has announced it is working on an upcoming documentary about the Jonas brothers, giving fans “an intimate look” into the lives of Kevin, Nick and Joe, according to Variety.com. As well as the brothers’ themselves, their family will be documentary, which may well include Sophie Turner - Joe Jonas’ fiancée - and Priyanka Chopra - Nick Jonas’ wife.